We are incredibly excited to announce that you can book Italian Rail Journeys online via our site. We have been working very closely with Trenitalia, Italy's national rail company to achieve this and are thrilled that this service is now live and just waiting for you to book that dream journey through one of Europe's most diverse and beautiful countries. Italy is famous for so many things; incredible food, romantic cities, rustic and breathtaking countryside and the wonderful Italians themselves to name but a few. But what do you know about its trains? 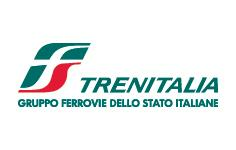 Trenitalia is the primary train operator in Italy. It is owned by Ferrovie dello Stato Italiane, which is, in turn, owned by the Italian Government. Trenitalia was created in the year 2000 following the EU directive on the deregulation of rail transport. They offer super fast rail services which are the quickest and most comfortable way to travel between cities in this incredible country. Should you have any questions regarding any of these trains then please contact us and remember you can now book Trenitalia trains directly online with us! Images courtesy of Trenitalia © Archivio Ferrovie dello Sato Italiane.